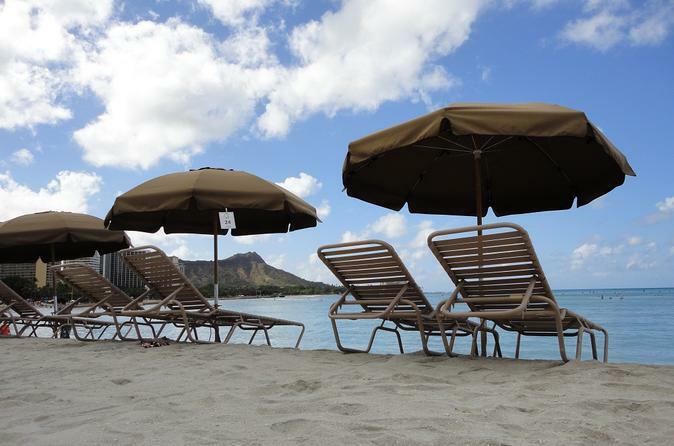 Relax under the shade and enjoy the view of the iconic Diamond Head and watch surfers catch waves at Waikiki Beach. Choose any time from 8:30AM to 4:00PM. Recommended to everyone who wants to relax on the beach as it can get really hot. You will be in front of the iconic Royal Hawaiian Hotel, relaxing under the shade, enjoying the view of the beautiful Diamond Head and watch surfers catch waves. Check in at least 15 minutes prior to the scheduled time. Bathroom is located at the Duke's Waikiki restaurant. Be sure to bring your own towel and sunscreen. Bring your own change of clothes. No shower rooms available. Bring cash or credit card for additional services such as Outrigger Canoe Surfing, Surfing Lessons, Stand-Up Paddling Lessons or just want to shop in the neighborhood.